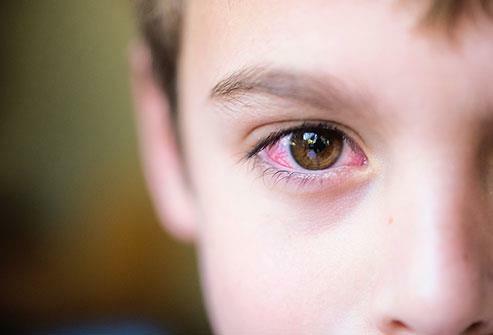 Master Uttam Malhotra; 5-year-old boy was brought to Advanced Eye Hospital and Institute (AEHI), located at Sanpada, Navi Mumbai by his parents with complaints of redness & pain in the right eye, and a problem in seeing things clearly. They seemed extremely anxious and wanted to meet Dr. Prachi Agashe. Uttam had to undergo the routine eye examination first which is when he was asked about the injury. His parents mentioned that 3 days ago Uttam injured his eye during his sports period. The kids were playing football during their sports period when the gravel on the ground hit Uttam in his right eye and since then he wouldn't stop crying and complaining about the pain in his eye. Uttam's class teacher was informed who took him to the school nurse. The school had called the parents and asked Uttam to be taken home since no obvious injury was seen. Uttam's parents thought he was fine and wouldn't need any medical attention. But Uttam still complained about the pain which is when they spoke to the school nurse who asked them to see a paediatric ophthalmologist. Since Uttam's parents hadn't heard of a paediatric eye specialist as such they asked if the school could recommend someone which is when they mentioned Dr. Prachi Agashe; to be the best paediatric ophthalmologist in Navi Mumbai. After the routine eye tests, Uttam was taken to meet Dr. Prachi Agashe; Pediatric Ophthalmologist and Adult Squint surgeon. Dr. Prachi examined Uttam's eyes to understand the extent of damage done. His left eye was normal but his right eye showed an ulcer on Slit Lamp examination. To be able to treat the ulcer efficiently a Fluorescein stain test was done. This was the test that would determine the treatment course. Since the damage didn't mandate an eye operation; he was prescribed antibiotics for 5 days and asked to follow up after 2 days. On follow-up, his eyes seemed to be healing better. Uttam's parents regretted their decision of not getting their child sooner. They are grateful to Dr. Prachi for helping their child through his eye problem. Corneal Ulcer also known as Ulcerative Keratitis is an inflammatory condition of the cornea (clear tissue in front of the eye) involving disruption of its epithelial layer with the involvement of the corneal stroma. 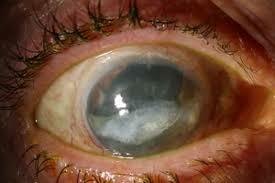 It typically occurs as a painful, red eye, with mild to severe eye discharge and reduced vision. Dr. Prachi Agashe, (Fellow Pediatric Ophthalmology, DNB (Ophth), MBBS) is a Paediatric Ophthalmologist at the Advanced Eye Hospital. She has a lot of experience and expertise in dealing with children’s eye problems.